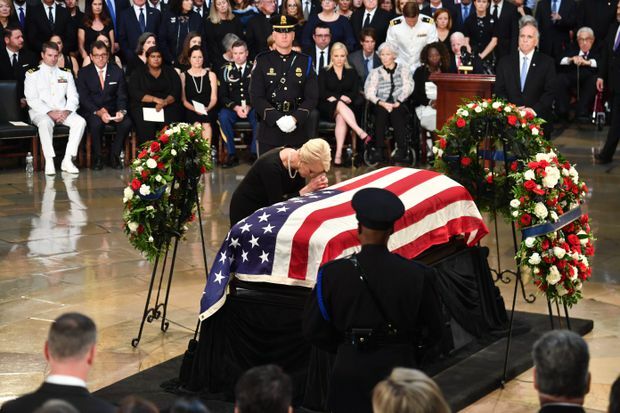 Cindy McCain, John McCain's wife, prays at the casket of her husband as he lies in state at the U.S. Capitol Rotunda in Washington, Aug. 31, 2018. Washington’s bitterly divided leaders came together on Friday to praise the late Senator John McCain as an embodiment of America’s fighting spirit, idealism and sense of humor, but there was one notable absentee: President Donald Trump. “He had America’s fighting spirit, our noble idealism, our solemn patriotism, and our slightly irreverent streak -- all rolled into one,” McConnell said.